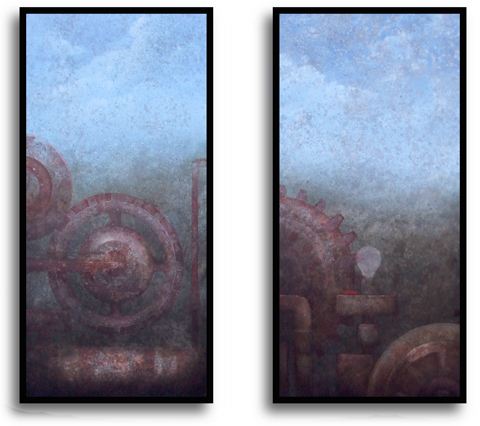 Two new paintings that will be included in the March 7 show. Dunno, if the 'greenies' have their way, that would all be a pile of rust. Or is that an energy 'saving' light bulb I see? You know, the kind you have to call out a Hazmat team for if you break it. Wow! Kind of unlike anything I've seen you do. No figures? But they still have that famous texture. These are ominous...I can taste the rust! I bet these are very impressive in real life at 48". Thanks, sir. It's one of the very few times a portion of the figure is not necessary. In fact, the LACK of a figure kind of has a slighltly spooky vibe that contrasts with the other work. Actual size, ALL the details pop. Rescaled, the light spot (a bulb?) on the right canvas--& the way the background textures merge behind it--reminds me of "The Scream". I LIKE--without regard to that spot--although I like "The Scream" too. Looks like a metaphor for what the national economy will be like if that "stimulus package" is passed (all the government spending with the alphabet soup of new government entities under FDR's administration served to LENGTHEN the Depression by seven years). This page contains a single entry from the blog posted on February 3, 2009 2:42 PM. The previous post in this blog was Groundhog Day.